Since 1974, SymCom has been a leader in electronic control and protection design and manufacturing with an array of current and voltage monitors, motor and pump controls, and custom electronic controls under the brand names of MotorSaver® and PumpSaver®. In 2014, electronic’s leader Littelfuse acquired SymCom. Founded in 1927, Littelfuse is the world leader in circuit protection with growing global platforms in power control and sensing. Littelfuse Symcom products monitor power supplies and protect motors and other pumps before damage occurs from over-voltage, under-voltage, voltage unbalance, single-phasing, phase reversal, over-current, under-current, current unbalance and ground fault. Littelfuse SymCom products include a variety of voltage monitors, current monitors, remote monitors, overload relays and power factor monitors for the motor protection market. Littelfuse Symcom continues to provide cutting-edge electronic technology with newly integrated micro-controllers with enhanced communications and capabilities. Their products have been upgraded over the years to include the latest electronic technology. More powerful state-of-the-art micro-controllers are being integrated into new products, enhancing communications and controls capabilities. As a Littefuse licensed distributor, National Fuse Products offers a wide variety of Littelfuse Symcom products. 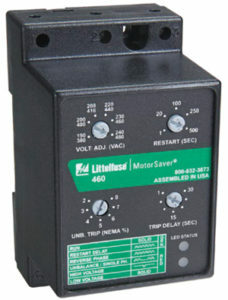 For more in-depth product information, please see the Littelfuse Catalog of Protection Relays and Controls. If the Littelfuse Symcom product you are looking for is not shown here on our website – just give us a call at 800-328-0496 or email us at sales@nationalfuse.com and our customer service team will be glad to help you. We normally are able to get any part or product you are looking for at a very competitive price.